Chief Minister Prem Kumar Dhumal said that state Government had succeeded in getting approval of Rs. 1155 crore World Bank Project for preservation of Environment in the State. He stated it in a public meeting at Tauni Devi, in Hamirpur district today, after making the newly sanctioned Tehsil Bamson at Tauni Devi functional, 6th in the district and 84th in the State. He also dedicated newly constructed Science Block in Government Senior Secondary School, Tauni Devi, completed at a cost of Rs. 87 lakh to the students of the school and laid foundation stone of residential complex for employees of Block Development Office, estimated to cost Rs. 38 lakh, today. Earlier he also dedicated newly constructed community hall at Shiv Temple in gram panchayat Panjot, to the devotees. Chief Minister said that Himachal Pradesh had been the role model in environment protection in the country and appealed to the people to save environment and plant more trees to increase the green cover in the State. He said that water, forests, land, were essential ingredients for sustenance of all living beings and society needed to be educated about the same. He said that World Bank had always been lauding such initiatives of the State Government directed towards protection of environment. 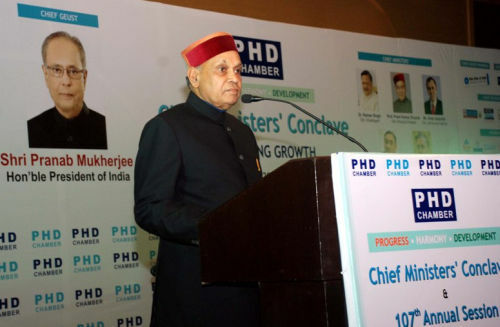 Prof. Dhumal said that the State had ranked at number one for third year consecutively in implementation of 20-Point Programme in the country. He said that per capita income in the state had increased from Rs. 43,000 in year 2007-08 to Rs. 73,000, registering an increase of Rs. 30,000 in past four and a half years. He said that social security pension was vision of BJP and was started with Rs. 50 per month and had now been increased from Rs. 200 in year 2007-08 to Rs. 450 while the previous government had not added even a single rupee. He said that 1,15,600 new pension cases had been sanctioned during current term. Chief Minister said that despite the reduction in ration quota by the UPA Government the State Government had endeavoured to provide consumers relief by subsidizing the essential commodities for which the State Government was spending Rs. 140 crore for the current financial year. He reminded people of the food grain schemes during NDA regime when plenty of food stuff was available on need basis to the people. He said that Annapurna Yojna was vision of former Prime Minister, Shri Atal Behari Vajpayee. He said that free ration was distributed amongst the poor people above 65 years of age having no source of income. He said that cheap electricity was being ensured to domestic consumers by subsidizing the same and the state was spending Rs. 190 crore during current financial year over the same. He called UPA Government as full of scandals when record and highest scandals had taken place. Chief Minister said that Hamirpur as a district had came into being on September 1, 1972 and had completed four decades when record development had taken place in the district. He said that that tehsil Bamson had also been opened on this historic day to facilitate people with various revenue and administrative services. He said that there would be 19 patwar circles under its control and would serve about 36,000 populations in the area. He said that efficient revenue services would henceforth be available to people at their door steps. He said that e-stamping facilities would also be available. Prof. Dhumal remembered his school days when he had studied in DAV School, Tauni Devi for a couple of years. He expressed happiness to meet his old school mates. He said that memories of childhood days had been revived with the visit to the school. He shared fond memories of school days with the audience. He appealed to the people to solidly stand behind BJP by extending all support to its policies and programmes. Chief Minister was also presented bank drafts as contribution towards Chief Minister’s Relief Fund. He also distributed track suits amongst the outstanding sports students of the school. Earlier, Chief Minister also addressed public at Panjot where he was welcomed by local Gram Panchayat Pradhan, Shri Sanjeev Kumar. Education Minister Ishwar Dass Dhiman said that educational institutions were the nurseries of future citizens where young minds were moulded and given perfect shape. He said that there was tremendous increase in the budgetary provisions for education which was 19 percent of the total annual budget of the State. He said that record over 20,000 vacancies of teachers had been filled up in Education while 5,000 more were in the pipeline. He said that Government school students were now finding place in the merit list of Matric and Plus two examinations, which signify the quality education in state owned educational institutions. He said that ‘Atal School Uniform Yojna’ aimed at bringing about uniformity in educational institutions where 9,28,365 students were getting two pairs of free uniform with stitching charges of Rs. 100 each pair. Des Raj Sharma, President, District Hamirpur BJP, said that September 1, 2012, would be remembered as a red letter day in the development history of Bamson assembly segment when people of the area were provided separate tehsil. He charged preceding government for neglecting Hamirpur for development and the same gained momentum only when BJP came to power on December 30, 2007. He said that road density in the district was highest in the State and national level vocational educational centres had been opened and it had emerged a hub of education. He detailed other major developmental milestones established. Vijay Behl, Vice President, District BJP and Virender Thakur, General Secretary, Sujanpur BJP Mandal, thanked Chief Minister for record development entire State had witnessed. He said that entire State witnessed uniform and balanced development during past four and half years. Prithi Singh Thakur, Veteran BJP Leader, welcomed the Chief Minister and thanked him for opening tehsil for Bamson population. M.C. Parmar, CMD, Ex-Servicemen Welfare Board, Joginder Verma, Chairman, Building and Construction Workers Welfare Board, Pyare Lal Sharma, Chairman, APMC and State President, BJP Kisan Morcha, R.S. Mankotia, Chairman, Kangra Central Cooperative Bank, Ajit Chauhan,Chairman, HIMCOFED, Sarla Sharma, Chairperson, Zila Parishad, Rajender Singh, Deputy Commissioner, Madhusudan Sharma, Superintendent of Police, M.S.Kanwar, Chief Engineer IPH, other senior officers and prominent people of the area were present on the occasion.